Bob Roberts makes intense watercolors on paper - creating dense, fanatically detailed compositions that draw from traditional American tattoo flash, Tibetan thangkas paintings, and outlaw motorcycle imagery. 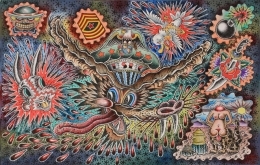 His most recent works are inspired by artists like John Altoon, Phillip Guston, H.C. Westerman, and comic legends Rick Griffin and R. Crumb, as well as surf culture, and classical Chinese and Japanese painting. Roberts' experiences as a musician, biker, and iconoclast flavors his personal work. As a saxophonist, he was part of the milieu of Frank Zappa, in addition to playing with Ruben and the Jets, Hot Tuna, the New York Dolls, and the Offs. 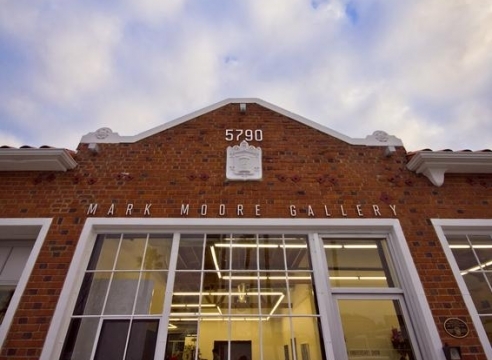 He first started professionally tattooing in 1973, while concurrently making his artwork, and is the founder of the famed Spotlight Tattoo in Los Angeles. 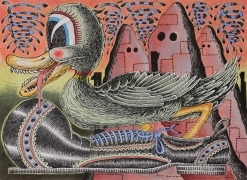 His paintings have largely enjoyed an underground reputation as a living legend among the international body art community.